A tough little ground cover plant Dymondia margaretae is a wonderful selection for planting between pavers, or even as a lawn substitute. 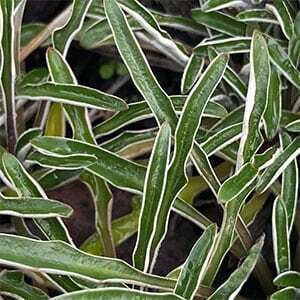 It is very low growing, forms a dense matt and once established will suppress weeds. It is tough enough to survive occasional foot traffic, and attractive enough to look great through the year. As long as drainage is good, Dymondia margaretae will be happy in a reasonably sunny position. The root system is deep so it requires little extra water except in long dry spells. It does spread by underground runners however it is slow to do so and is not regarded as invasive in a garden situation. Use it between pavers, to fill a narrow edge along a path or driveway, or use it to underplant taller shrubs. If you are using small plugs, you can space them at around 10 – 15 cms apart (4 – 6 inches) and they should fill fairly quickly if you water them through the first spring and summer. Common Names – Silver Carpet. Spread – This is a plant that will spread by underground runners, so spread will depend on location generally around 30 cm. Foliage – Green grey leaves, curled to reveal the reverse which is silver. Flowers – Small yellow daisy like flowers in spring.